Below is a screen shot of VIRL. It is using Oracles VMMaestro GUI based on Java. 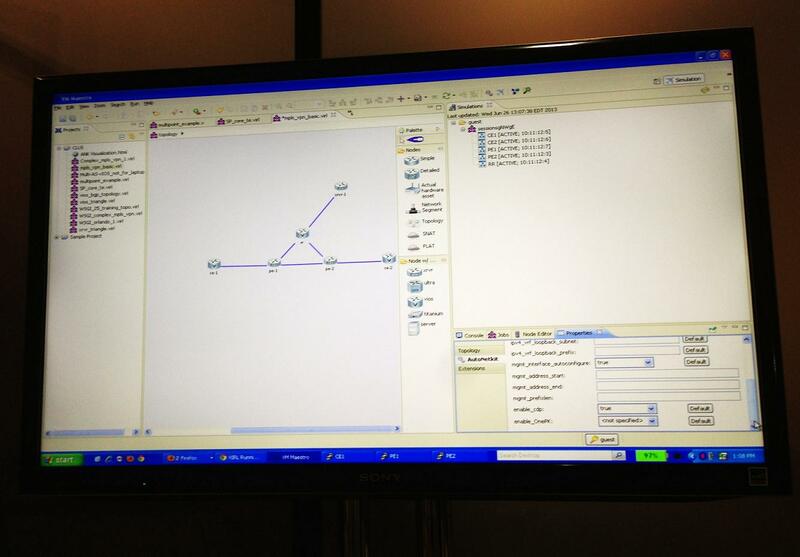 In the screen you can see network topology which is drop and drag. On the left side in purple there is a list of all saved networks. The right middle side has a list of supported devices. Top right side has all of the currently running devices and bottom right preconfiguration tabs. To access CLI of these routers, you has to run in simulation mode then Telnet to individual devices. The preconfiguration is a nice feature that allows you preconfigure IP addresses, Loopback interfaces or routing protocols like OSPF or BGP. Virtual Internet Routing Laboratory screen shot. VIRL supports virtualizing Cisco’s modified operations system. Cisco created modified versions of their OSes with all features that are not hardware dependent. They are not able to map physical features of all platforms into one tool. It is different than GNS3. VIRL does not use regular IOS version. These virtual routers are basically virtual machines running in the background. There are four different operating systems that are supported: VIOS (emulates IOS), Titanium (emulates Nexus), XRVR (emulates IOS-XR) and Ultra. These images will be available from Cisco to download. Currently only Ethernet interfaces are supported, but before the public release more interfaces types should be available. Additionally, you will be able to run virtual servers within the topology. Running any virtual server opens up the testing environment to many capabilities that run in the production networks. There is a feature to SNAT the topology with existing physical networks. Both of these capabilities provide options to scale outside of the virtual environment. The virtualization is so good that Cisco is concerned that people will use these in production. The first option is running VIRL on your laptop. This is similar to running GNS3. The limitation of this is your laptop’s hardware resources like RAM and CPU. Each VIOS shouldn’t take more than 200-300 MB of RAM. It is the VRVR (IOS-XR) that needs 4GB of RAM (not sure about the other ones). The second option is connecting to a server internally on your network. Most likely that will be an appliance either virtual or physical. This option works better for large scale topologies with lots of emulated devices. Devices could be accessed with Putty and topology can be designed with the fat client using VMMaestro. The second options fits for validating production network designs. If you are not interested in locally hosted VIRL, there is a third option which is hosted in Cisco’s cloud. From my conversation with Cisco, this will be accessed using Cisco’s learning network. Access could be provided with VMMaestro or a web design tool. This option is the most scalable and might look similar to Junosphear. Access could be purchased in a similar way as rack rentals but at any time without time slot limitations. It doesn’t look like Cisco has figured out the pricing and licensing model just yet. All I know is the the laptop version is meant to be affordable anywhere between $100-$500. I would figure the appliance would be little more costly and the cloud hosting much more affordable. “Cisco is not trying to make money on VIRL” (that’s not my quote). They realize that certification and training is just another form of marketing for their productions. When will it be released to the general public and how can you get your hands on it? Cisco is planning on releasing the first public release in Jan 2014. I asked about beta testing and … well I think they already have way too many people interested. Unless your account team has a lot of pull, January is just right around the corner. Overall I really liked VIRL. I think there are few bugs for them to iron out. Usability was OK, with a small learning curve. VIRL is going to bring access to platforms that are very difficult to access like IOS-XR and Nexus to every network engineer. The more engineers know how to use these platforms the more they will recommend them. I think it is a win-win for Cisco and for anyone learning about networking. Cisco just recently released their longly awaited VIRL. Seem like cost they finally decided on is $200 for personal version and $80 for an educational version. The educational version has all of the features, but requires proof of being a student or a teacher. For more information you can go to virl.cisco.com. Have you purchased it? If so please let us know your experience with it in the comments. This entry was posted in blog and tagged CiscoLife2013, gns3, screen shot, titanium, ultra, vios, VIRL, virtual internet routing laboratory, xrvr by Tom Kacprzynski. Bookmark the permalink. Nice. What kind of OS is Ultra? Can’t wait for this to come out. That’s the one I’m not 100% sure, mybe someone else would know. If anything it could be IOS-XE. Ultra is the internal name for XE. Good article. One question, you mention what 3 of the 4 OS emulate but don’t explain the purpose of Ultra. Can you shed any light on what Ultra does? I think that one is IOS-XE, but not sure so I didn’t want to include it in the article. When I was speaking to Cisco they are planing on moving as much of their equipment in certification labs from physical to virtual. The CCIE RS and CCIE SP already use some virtual routers for IOS devices. With the introduction of other platforms like virtual IOS-XR, that will move another platform over to the virtual emulation. I think it will take a while before all physical devices are gone in certification labs, but it appears to be heading that way. Now will Cisco work with other vendors to provide hosted access to VIRL? I’m not sure, but it will be interesting to see what happens. Cisco might enter the virtual rack rentals market with VIRL or provide it to training vendors on a special license basis. My impression was that they will try to compete in this new market. Nice Write Up Tom.. thanks for looking out for us back at home. 1.- what about the release date? 2.- could this be connected to real gear (for example real switches)? It’s still not free, which means GNS3 will continue to be the most popular option. If you are serious about your certs you’re going to leave GNS3 behind. GNS3 will remain to be free but it does have severe limitations that VIRL seems to not have. The only IOS image that isn’t supported on the all but the 7200 is 15.x. I showed my network manager GNS3 when I RDPd into my house, showed him how you can run multiple routers and connect switches into it, it’s how we POC (proof of concept) on current IOS images. The one nice thing about VIRL is it lets you use NX-OS, which I have never been on before, I haven’t gotten titanium to work, I did get the UCS VM up but I don’t have any clue how to work it. I am happy to hear Cisco is thinking about the engineer and not the bottom line for once. Its the engineer that needs the exposure to the environment, not Cisco stretching their waistline with my money. I’m pretty sure that if Cisco wanted to make a boat load of money they could easily only offer rack rentals and charge out the wazoo for it. My hope is that IOS XR and NX-OS are pretty easy to migrate to from regular IOS. There are a few Nexus 7ks in my DC that I don’t get to play with. I’m not a senior engineer. But regardless of how Cisco deploys VIRL it’s going to revolutionize training and certification. I disagree with networking going to all VMs and SDN. There will always be a hardware advantage that software can’t compete with. That’s obvious when you look at someone running a virtual switch and they can’t run hardware switching. I’m a huge fan of CEF. can we run ASA and switch in that…and what about virtual machine like wsa or ise..can we run inside VIRL ..or we have to run seperate in vmware workstation and connect through virtual adapter..﻿to VIRL..like we do with gns3.. I don’t know when Cisco will release publicly, awaiting since JAN 2014. Thank you, your article is very good about Virl. could you connect with another item Virl using the SNAT?